Vodka Jello Shots are a classic party cocktail that’s easy to whip up and can be made in any flavor of Jello you love! Be sure to make a bunch, they go fast! Ready to make the most beloved college party cocktail ever? Vodka jello shots have been a staple with my friends and me ever since our 20’s. We’d make them for Saturday nights at Chris’s house, we’d take them tubing down the Salt River, and they popped up just about every time someone had a party. 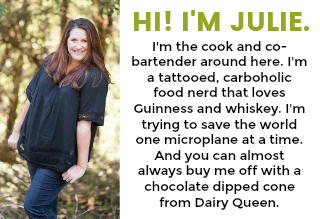 What’s not to love about jello shots?! They’re easy to make, everyone loves them, and the colors make them extra fun. So clear out some space in your fridge and let’s get going! This recipe is for your basic vodka jello shots. We’re not making them from scratch with unflavored gelatin. We’re using boxes of flavored Jell-O gelatin mix. 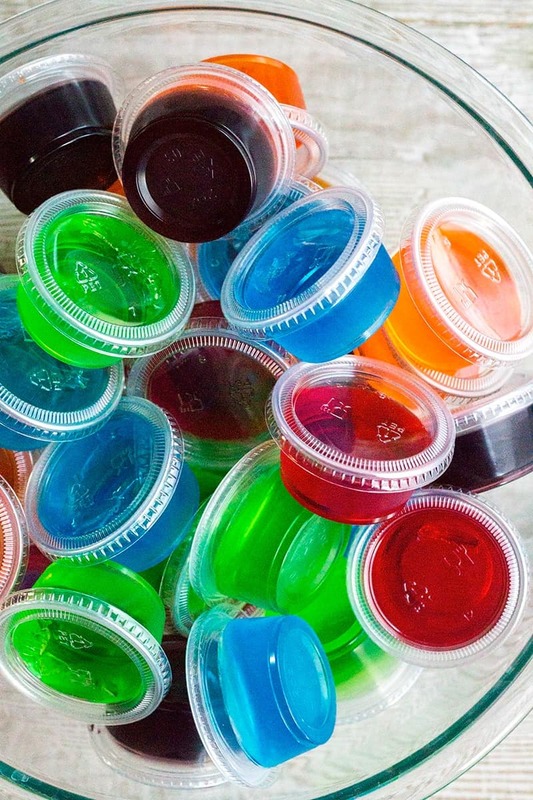 While I love unique jello shots, simple, classic jello shots with vodka are my go-to for any occasion that warrants jello shots. The only real decision you have to make for this recipe is which flavor of Jell-O you want to use. Decisions decisions. Add cold water and vodka. Pour into cups and chill until set. See?! How easy is that? The hard part if waiting for them to set up. 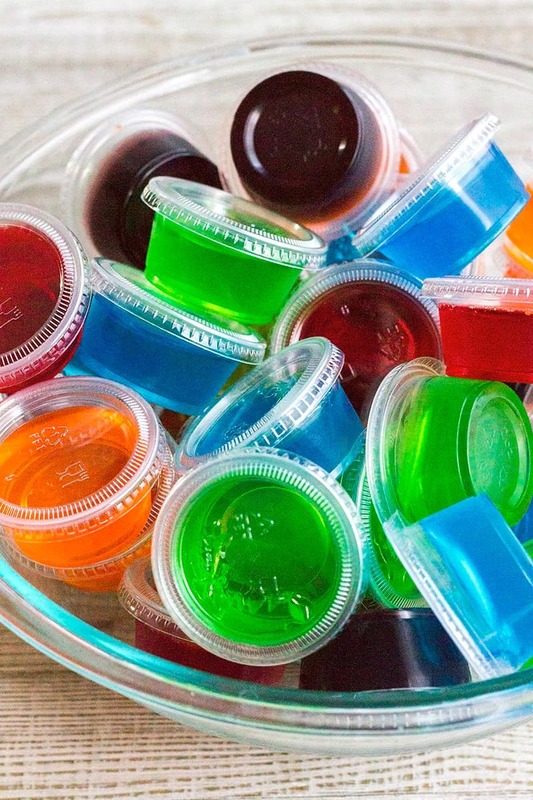 It’s worth noting you’ll get about 10 or so vodka jello shots per box of Jell-O. SO if you’re making one flavor you’ll want to grab a few boxes of gelatin. Or you can have fun with your colors and flavors and mix things up! 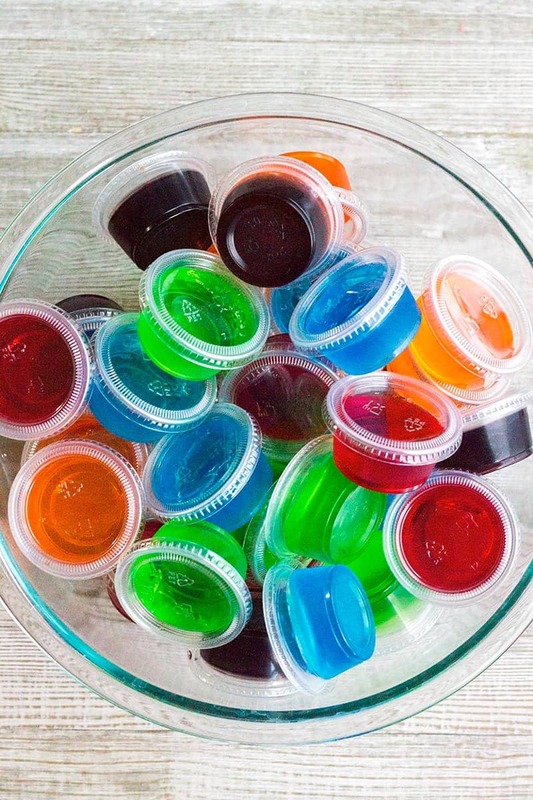 The cherry, grape, and berry blue are my favorites, but since vodka is neutral and doesn’t have a flavor you can really use whichever Jell-O you love best. Which kind are you mixing up? Vodka Jello Shots are a classic party cocktail that's easy to whip up and can be made in any flavor of Jello you love! Be sure to make a bunch, they go fast! Layout plastic cups on a baking sheet without the lids on. Set aside. Place gelatin mix in a medium mixing bowl or 4-cup liquid measuring cup. Pour in hot water and whisk until gelatin is completely dissolved. Pour in cold water and vodka. Whisk to combine. 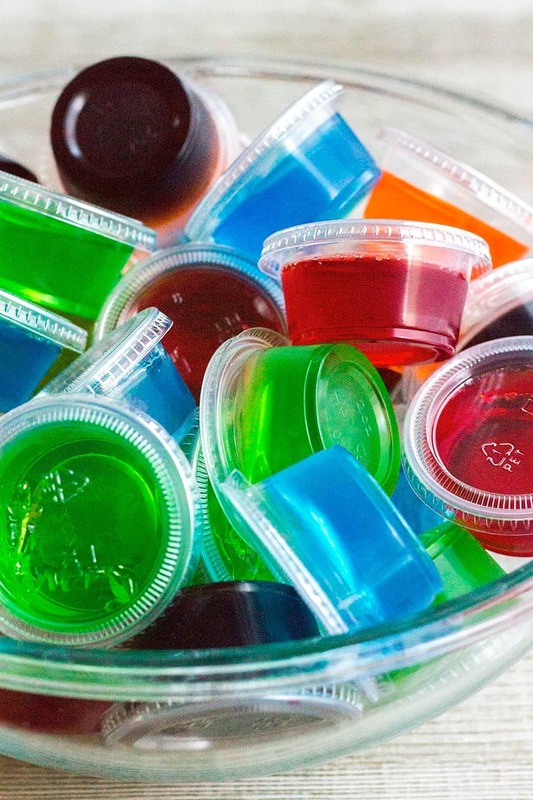 Pour the jello shot mix into each plastic cup, filling until almost full. Refrigerate the shots for 2-3 hours or until set. Put lids on cups and store in the fridge until ready to serve. 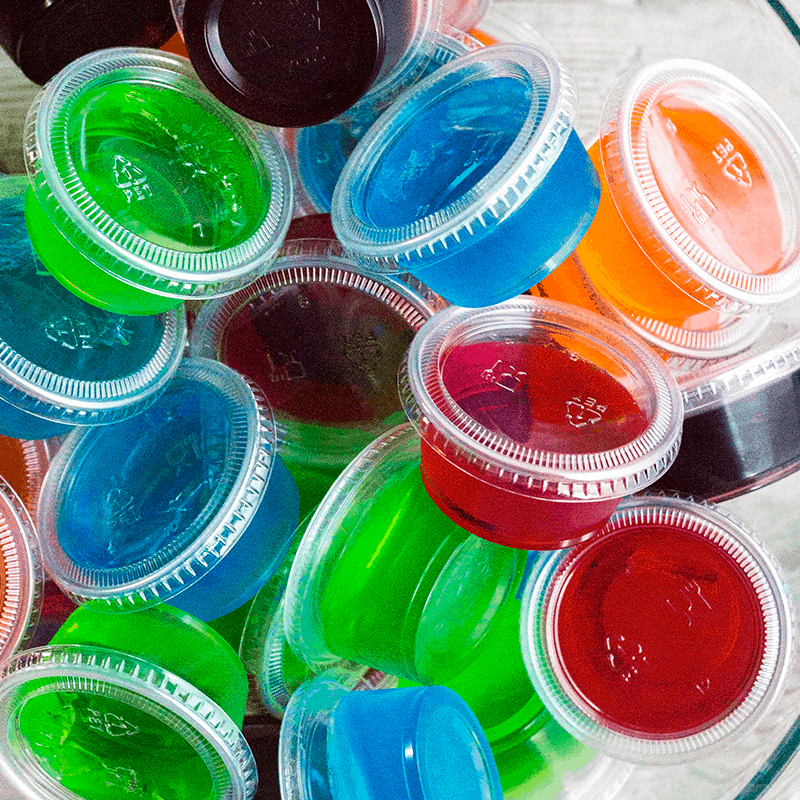 You can use any flavor of Jell-O you like. I grabbed grape, orange, cherry, lime, and berry blue. Each 3-ounce box of gelatin mix will make about 10 shots, so it's good to make a few different flavors. Want to kick these shots up a notch? Omit the 1/2 cup cold water and use 1 cup vodka instead. Just be sure to warn your friends! Awesome Anthony! I’m so glad they worked out so well for you!! What kind of pan did you use to get them out of the cupcake pan in tact? Hi Ms. K! You can use a silicone pan so you can pop out the shots or give your muffin tin a quick spray of coconut oil (or cooking oil if you’re cool with that) so the jello releases. Looks colorful! My kids asked me to make them. Super simple to make, I wound up making cups instead of regular little shots! I did grape and black cherry ones and used strawberry vodka. What type of pan are you using to release the jello, plz? How long are Jell-O vodka shots good for? 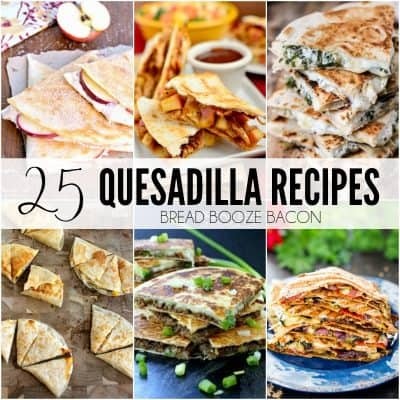 I made them on New Years Eve and now I am on a 21 day challenge with no alcohol. Will they still be good on January 23? Thanks for a great recipe and the nostalgic memory of tubing the Salt! I no longer live in Az but have great memories of all the desert fun!! How far in advance can you make these? I have a party Friday but would like to not make them last minute unless it’s necassary. I was hoping to make them a day or two before?